You Are Here: Home » Neymar news: 2018-19 » Levante 1-4 Barcelona: Tello hat-trick made it right this time! Barcelona line-up: Pinto, Adriano, Bartra, Puyol, Daniel Alves, Song, Xavi, Sergi Roberto, Pedro, Lionel Messi, Cristian Tello. Just a few days after having slipped at this very same stadium, Barcelona revisited Levante this Wednesday night for the Copa del Rey quarter-finals first leg and managed to already virtually decide the round in their favor. Levante would be the side breaking the deadlock though, as they scored the opener around the 31st minute of the game, after winning a few rebounds inside Barcelona box until El Zhar finally finished it off from close range. Barcelona couldn’t count with Neymar on the field and all their hopes were set on Lionel Messi, at least that’s what everyone thought ahead of this game. The reaction came on in the second half and the equalizer resulted from a quite peculiar play. A bad clearance inside Levante‘s box saw the ball being sent straight into Juanfran and slowly going past the goal line. We were playing the 53rd minute of the game and it has definitely been a rough blow for the home side’s aspirations. 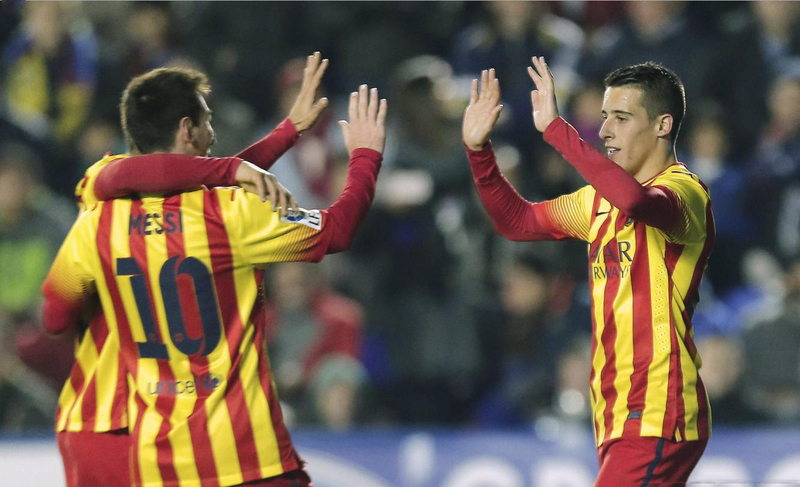 The Messi and Tello show would start a few instants later. 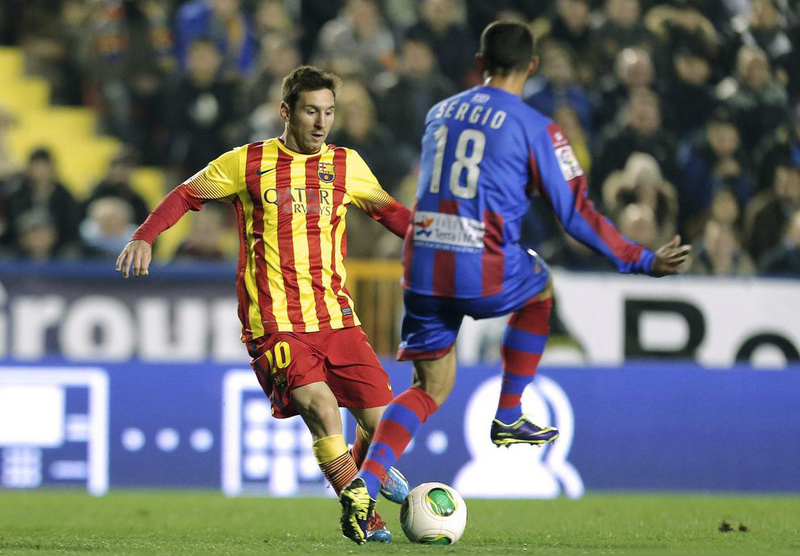 In the 60th minute, Lionel Messi found Tello escaping Levante‘s defense and delivered a great ball for the Spanish youngster to go into a 1-on-1 situation with the visitors’ goalkeeper. 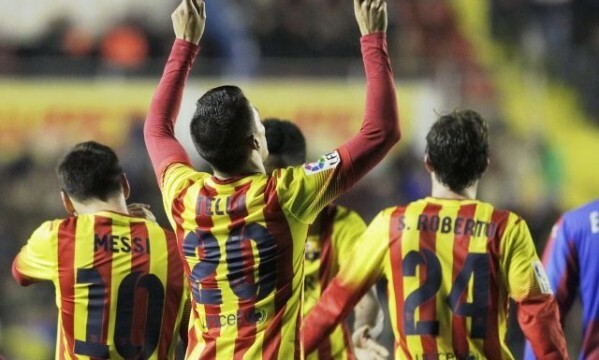 Tello didn’t hesitate and sent Barça to the lead for the first time on the night. In the 81st minute, more of the same. Messi cutted inside, waited a few seconds for Tello to make his move and put him face to face with Levante‘s goalkeeper for a second time. 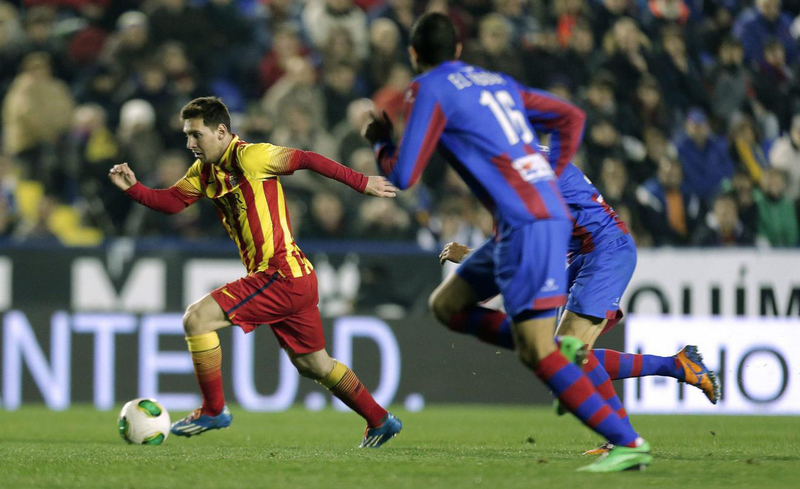 The 22-year old footballer converted without much problems and Barça extended their lead into 2 goals. The game wouldn’t finish before Tello‘s hat-trick got completed and before Lionel Messi making his third assist on the night. This time the Argentina international sent the ball over Levante‘s defensive line and got to see Tello controlling with great class, before finishing it off to set the final score in 1-4.